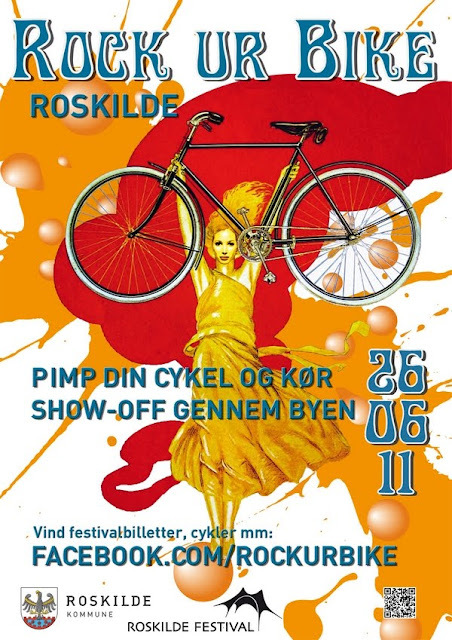 Copenhagenize is pleased to be involved in the creation and design of a bike event that will take place in conjunction with the Roskilde Festival and Roskilde Municipality on June 26th, 2011. Rock Ur Bike will take place on Sunday, June 26th. Roskilde Festival starts on June 30th but the camping areas open on June 25th and warm up music starts on the Sunday, to entertain the tens of thousands of festival-goers. It is a simple celebration of the bicycle as an integral part of society. As the poster says, "Pimp your bike and ride show-off through the city!". The ride is inspired by the crazy bike goodness at Burning Man festival in the USA. Roskilde Festival, since its inception in 1971, has become one of Europe's largest music festivals, with 80,000 people taking part, not to mention over 20,000 volunteers. The City of Roskilde is a bit older. A thousand years older, give or take. This year the city has a bicycle campaign to promote cycling called Roskilde Cykelby and the idea of combining the city's campaign with the massive Festival prescence in the streets was a obvious one. Copenhagenize Consulting has been involved in creating the event together with Roskilde Festival and Roskilde Municipality and we're looking forward to it. Very much so. We're hoping that festival guests and locals from the city will gather to celebrate the Iron Horse, pimp their rides and enjoy the 5 km ride out to the Festival grounds, stopping at Musicon - the music and culture institution - along the way. Rolling music will be provided by Copenhagen Showband, who also performed at the bike parade during Velo-City last year in Copenhagen. A bicycle song has been composed by Danish singer Sys Bjerre and will performed at the start of the ride. There are prizes, too! There are armbands for the first 300 participants to the warm-up concert on Sunday afternoon at the Festival. Then there is a Christiania cargo bike up for grabs in the Recycle category. Creme Bicycles are sponsoring two fine bicycles for the most creatively-pimped Gentleman and Lady. Rock Ur Bike kicks off at 12:00 on Stændertorvet in the heart of Roskilde and we expect to be at the Festival grounds by 15:00. Get pimpin' your ride. Celebrate the bicycle. Show off your ride and your bike love in Roskilde on June 26th! Rock Ur Bike Facebook Group with information and inspiration. Join the group in support even if you're not going to make it. Remember to sign up for the event on the Facebook event page.